(Nanowerk News) Researchers from the Attoscience and Ultrafast Optics Group led by ICREA Prof. at ICFO Jens Biegert, in collaboration with the Laboratory for Attosecond Physics at the Max Planck Institute for Quantum Optics (MPQ) and the Ludwig-Maximilians-Universität (LMU) in Munich, have developed a worldwide unique broadband and coherent infrared light source ("High-power sub-two-cycle mid-infrared pulses at 100 MHz repetition rate"). 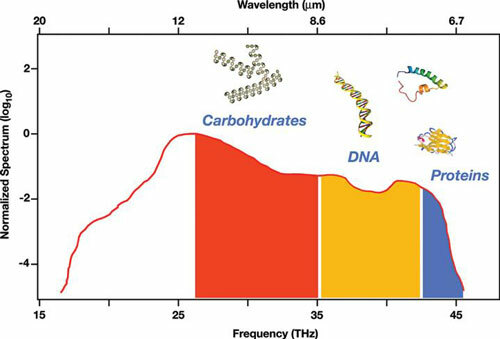 The record peak brilliance of the light source makes it an ultrasensitive detector for the infrared molecular finger print region, ideal to detect minute changes in the spectral features from cells or tissue which are tell-tale signs of DNA mutation or the presence of cellular malfunctions such as cancer. The mid-wave infrared is an extremely important range of the electromagnetic spectrum since the wavelength of the light can resonantly excite molecular vibrations. Consequently, shining light through a sample leaves the resonant fingerprints in the spectrum allowing identification. The absence of light sources that cover enough of the infrared spectrum with sufficient brilliance to detect minute concentrations originating from onco-metaboloids has been the main challenge in cancer detection. Now, ICFO researchers have collaborated with colleagues from MPQ/LMU to develop a light source which addresses this need. Their light source exerts extreme control over mid-wave infrared laser light with unrivalled peak brilliance and single-shot spectral coverage between 6.8 and 16.4 micron wavelength. The emitted radiation is fully coherent and emitted 100 million times per second. Each laser pulse has a duration of 66 fs which is so short that the electric field oscillates only twice. These characteristics, in combination with its coherence, make the light source a compact and ultrasensitive molecular detector. Prof. Jens Biegert and his colleagues at ICFO are currently investigating molecular sensitivity for the identification of cancer biomarkers on the single cell level using all optical techniques in the mid-wave infrared wavelength range.